Microsoft gave developers a peek inside Xbox SmartGlass during a Friday morning session at its 2012 Build Conference, the company's annual developer event. SmartGlass is a free Windows 8 Store app that gives smartphone and Windows 8 tablet users enhanced "second screen" experiences with certain Xbox 360 applications, including games and streaming media services. It's actually a very nifty technology, but during the SmartGlass session, Microsoft essentially told small, indie developers that SmartGlass won't be part of their roadmaps. Neil Black, Principal Program Manager in the Xbox Live group, walked attendees through various scenarios for the app, and discussed current and upcoming title support. Halo 4 support had been revealed earlier this year at E3, but on Friday Black dipped into Forza Horizons, a new racing game that uses SmartGlass to show interactive maps, and even allows players to set waypoints, creating a GPS route inside the game. Other games destined to receive the SmartGlass treatment include Dance Central 3 and Home Run Stars. Large scale content providers, including NBC TV will also be supporting the app. 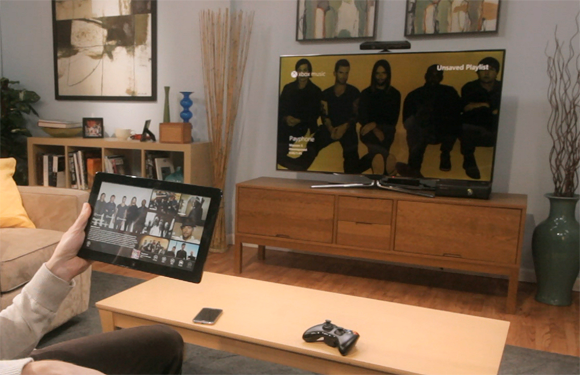 SmartGlass can provide a "second screen" experience for many Xbox 360 functions. Full support for the various sensors in new-generation PCs and smart devices open up interesting interface possibilities, but Black suggested that developers closely examine each use case before implementing a SmartGlass feature. For example, using the accelerometer in a smartphone to emulate a baseball sounds cool, but the possibility that users may accidentally throw their expensive phones into even more expensive HDTVs might be something a game developer would want to avoid. Black also threw cold water on broad-scale deployment of SmartGlass for smaller, independent developers. Indie developers have achieved significant penetration in the Xbox Marketplace through XNA Studio, which enables them to use Microsoft as a publisher, in much the same way Windows developers are looking at the Microsoft Store on Windows 8. So there you have it. SmartGlass is a cool technology, but it won't be available to the smaller publishers who've helped turn the Xbox platform into a home for innovative indie games.